As far back as World War I, militaries have used large-scale chemical weapons in warfare. A number of treaties have banned these chemical agents since then, but chemical warfare still manages to make headlines today. In 2013, the Syrian military used sarin gas to devastating effect during the country’s civil war. With troops deployed around the world, the U.S. military seeks to ensure soldiers’ safety against potential chemical attacks. University of Cincinnati Professor of Chemical Engineering Anastasios Angelopoulos, Ph.D., is studying potential defenses for these chemical agents. One solution lies in the very fabric of soldiers’ uniforms. 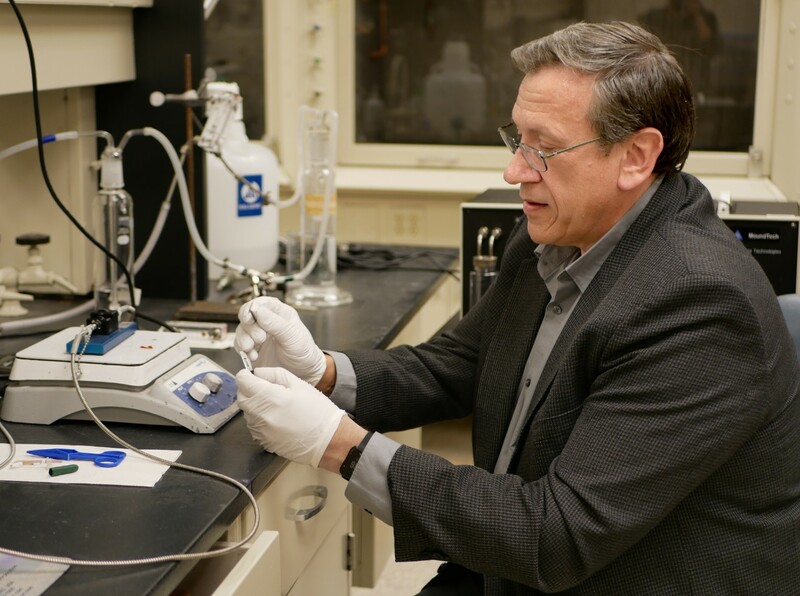 Angelopoulos was recently awarded a $324,551 grant from the National Science Foundation (NSF) to study the transport behavior of organic molecules, including those similar to chemical warfare agents in the commercial polymer Nafion. 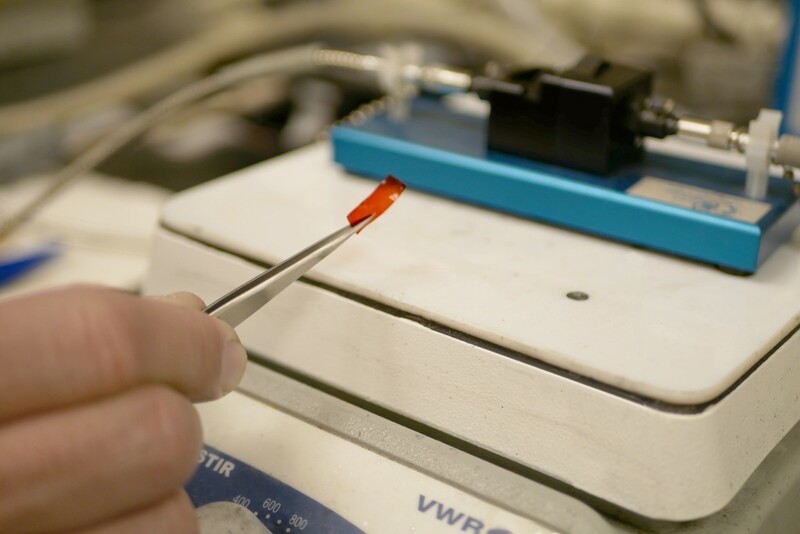 The research is a collaborative project with University of Florida Professor of Chemical Engineering Sergei Vasenkov and fellow UC professor Jonathan Nickels who is co-principal investigator on the grant. A key goal of the work is to create a protective membrane that may be woven into soldiers’ uniforms. The idea is to incorporate the naturally flexible Nafion membrane into a soldier’s clothes to detect chemical agents in the air while preventing them from interacting with the skin. “The project is geared toward understanding how the complex structure of Nafion can be used to trap and convert chemical warfare agents into benign materials,” says Angelopoulos. 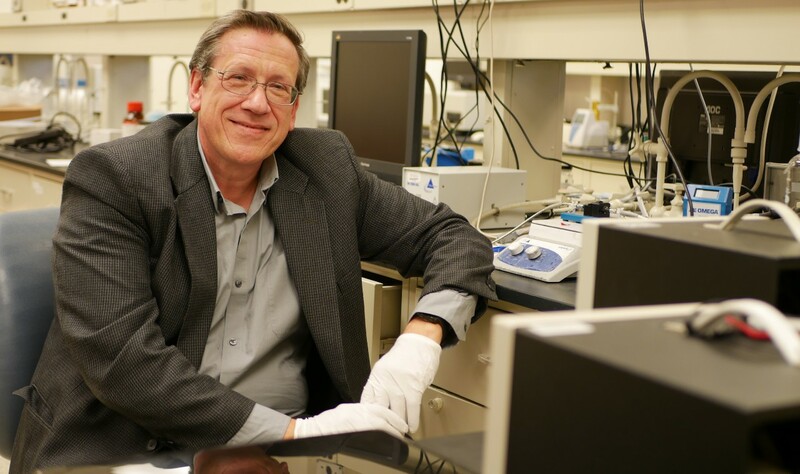 Angelopoulos has an extensive background in fuel cell research and has worked with Nafion for years. Nafion plays an important part in electricity generation using fuel cells. In a commonly used fuel cell, hydrogen gas is confined to the anode (the negative electrode) and oxygen gas to the cathode (the positive electrode). Hydrogen gas is oxidized at the anode to produce protons and electrons, both of which must travel to the cathode to complete the electric circuit. If the hydrogen and oxygen gases were to mix, or electrical current were to flow directly from the anode to the cathode rather than through an external device, however, the reaction would short-circuit. That’s where Nafion comes in. Nafion has unique structural properties that provide for electrical insulation and gas separation, while also promoting the passage of ions. This is especially useful in fuel cells, but Angelopoulos was drawn to its broader implications. If Nafion’s structure could be sufficiently understood, he thought, perhaps it could be manipulated to prevent the transport of chemical warfare agents. Nafion is already known to effectively limit the transport of large organic compounds, like those found in chemical warfare agents. The problem has been Nafion’s effectiveness in the presence of water. Soldiers sweat. A Nafion membrane woven into the fabrics of a uniform only works if it can be effective when soldiers sweat into it. Water can readily transport through Nafion, but if it also promotes the removal of chemical agents trapped in the membrane, a problem ensues. After years of study, however, Angelopoulos and his team found certain organic molecules exist that, even in the presence of water, can become trapped in a Nafion membrane. So, when it comes to water, why do some of these organic molecules become trapped in the membrane while other molecules move very freely in the membrane? The purpose of the NSF grant is to address this question and also determine how to convert these same agents into benign forms through chemical reactions. After all, once an agent is trapped within the threads of a soldier’s uniform, he or she won’t want to carry it around all day. On top of serving as an effective membrane to slow down and trap chemical reagents, Nafion can serve as a catalyst. In previously published work, Angelopoulos used Nafion to detect different organic molecules that we exhale in our breath, which he then used to diagnose diseases. When a patient exhaled onto a Nafion membrane, a reaction between a chemical pre-immobilized in the membrane and the reagents in the breath occurred, creating organic synthesis products known as Flavans. In other words, Angelopoulos could determine chemical compounds present in a person’s breath based solely on the color of the reaction. At the same time, the intensity of this color reflected the concentration present. Not only are soldiers protected by chemical warfare agents with this membrane – they’re also aware of the chemical agents present in their environment. That’s the beauty of this approach. Angelopoulos realized that, when applied to a soldier’s clothing, Flavans could further react with chemical warfare agents to form benign products. On top of that, during this process, Flavans changed in color. With Nafion applied to their uniform, soldiers could actually detect the presence of chemical warfare agents in the air just by being exposed to it. Soldiers’ clothes would literally change colors based on the chemical warfare agents in the air around them. Current defense against chemical agents involve bulky uniforms with limited mobility. Nafion, however, is popular in thin membranes and coatings specifically for its durability, thanks to its Teflon-like backbone. “The goal with Nafion is to have clothing that is flexible and gives the soldier maximum maneuverability,” says Angelopoulos. To reach this goal, the research team must evaluate these materials and how to blend them into a fiber that can be woven into a suit. A key to this goal lies in the way we understand the chemical warfare agents trapped in the Nafion membrane – What causes these agents to be trapped in the membrane? How much agent can accumulate in the suit before saturation? How does one even wash this suit? With the high price of Nafion, answering these questions first is necessary for a commercial scale-up. “Once we obtain fundamental understanding of how these organic materials imbibe into Nafion, we can start making some practical materials,” says Angelopoulos, who is already working on a future proposal on this aspect. The end result will eventually be a super suit of sorts: a color-changing, chemical-absorbing uniform that contours to each individual soldier. Angelopoulos has a long history with studying chemical agents, starting with his first job after college at a U.S. Army research lab. There he first understood the importance of detecting and protecting against chemical warfare agents. Beyond his professional interest in Nafion, Angelopoulos’ work with this material really hits close to home – he has two stepsons currently serving in the U.S. Army. Angelopoulos says this work with Nafion sprang from a combination of factors: His background with the Army, his work in fuel cell research and now this strong personal investment because of his family. I wondered what would happen if I took chemical agents to drive reactions in a Nafion membrane. And it works beautifully. 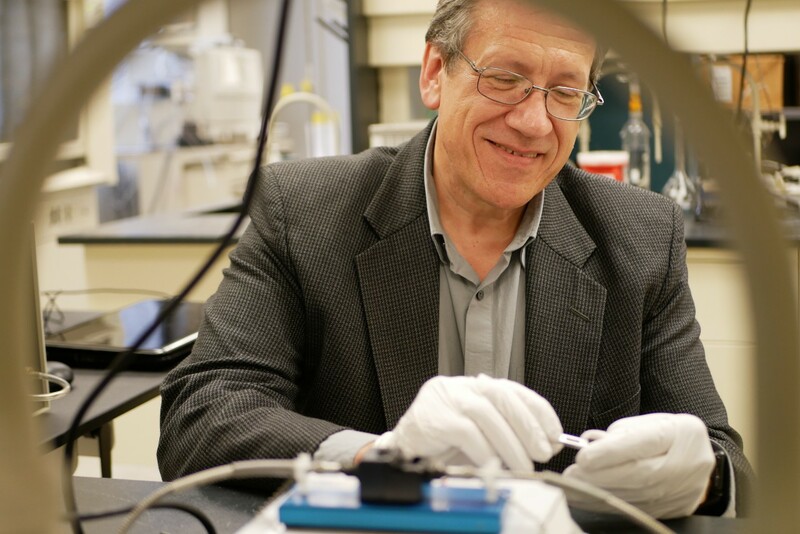 Angelopoulos and the research team still have plenty of questions to answer, and the funding from NSF will allow them to explore the vast implications for this technology. When all is said and done, the team hopes to offer several more practical uses for the unique polymer Nafion, while serving a greater national good. Note: Nafion is a registered trademark of E.I. du Pont de Numours and Company. The University of Cincinnati is classified as a Research 1 institution by the Carnegie Commission. UC students and faculty investigate problems and innovate solutions with real-world impact. Next Lives Here.